There are artists whose whole reputation hangs on one stupendous work – a painting, song or film that stands out as a singular achievement within the context of their output; case in point, Chubby Checker’s (deserved) reputation hinges on him having sung the most infectiously brilliant pop tune (to destruction) in musical history, despite having done precious little else of any real note. The contemporary musical counterpoint to this sort of phenomenon is best demonstrated by Newcastle’s prime purveyor of transcendental psych-rock brilliance, Mike Vest. As with Masami Akita, the relentless onslaught of creativity that emanates from Vest and his entourage reads like a feverishly well-kept journal of the Geordie psych-supremo’s state of consciousness at the given moment of the recording, of which the brilliant Haikai No Ku (Japanese for “District Of Destruction”) is a particularly rewarding recent manifestation. The band draws on a proud Japanese tradition of abstract psychedelic violence that starts (and arguably ends) with Les Rallizes Dénudés, Takashi Mizutani’s resolutely anti-establishment and confrontational freakout band that remain as unpalatably ahead of the curve today as they did at their inception in 1967. After hearing “Blind Baby Has Its Mother’s Eyes” for the first time, I was literally violently sick – Mizutani’s phasing guitarwork was a giddying and disorientating experience, and although Vest and his cohorts never quite reach such peaks of stomach-churning terror, ‘Sick On My Journey’ (an apt title…) is a supremely brilliant interpretation of the Rallizes sound, an uncompromising whirlpool of vertiginous reverb, delay and darkness, all dials permanently stuck in the red (of course). To describe the experience song by song is worthless, as the five pieces that constitute this album make up a dizzying whole that does not lend itself to piecemeal scrutiny. There are moments on both sides where an ambient fog of overdriven amps dominates the soundscape, and others where rhythmic drumming (a standout performance from Sam Booth) permeates a dense cloud of feedback and repetitive riffs, a mantra that has the ability to make you feel quite seasick, as the record ebbs and flows between melody and dissonance, quiet lulls and violent passages of unrestrained noise. The term “psychedelic” is given the following meaning in the dictionary: “…expanding the mind’s awareness”. 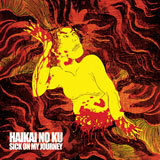 The abstract sonic paintings that Haikai No Ku have offered us with ‘Sick On My Journey’ are the very epitome of this, drawing on the listener’s psyche, delving into the darkest reaches of the dormant mind, resulting in an uncomfortable and terrifying assault on the eardrums. To pinch a phrase coined by Grumbly M: “Classic Vestcore”.